Nestled at the end of a cul-de-sac under the heritage oak and nature preserve, this home represents low-maintenace living at its finest. The open floor plan features high ceilings and tons of natural light. The kitchen has granite countertops, stainless steel appliances and an eating bar. Formal dining room, plus a large living area with gas fireplace. Master suite has a walk-in closet, a sitting area and a large bathroom with custom tile shower. 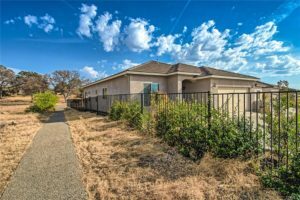 Backyard features a large patio with a metal gazebo, drought-tolerant landscaping and beautiful views of the nature preserve. Leased solar keeps the energy bills low at only $98 per month! Don’t miss out on this rare opportunity!